The term “Emerging Countries” was first used in the eighties by the World Bank. It is a classification that allows grouping markets that are no longer developing countries but not yet reached the status of a developed country. However, it is a definition too relative and can create confusion. There is no international consensus on which countries are emerging or not. As we can see, it is hard to achieve an exact definition of emerging country. Russia, for example, lacks a high political stability and yet is regarded as BRICS. Egypt is an emerging market but has political instability since the Arab Spring. The most important thing is that the vast majority of emerging countries are not the “classical” Western Civilisation Countries (except some cases like Argentina or Mexico of Latin American economic space). From a religious point of view, we can also observe the increasing specific weight of Hinduism, Sinic religions (Confucianism, Taoism), Buddhism, and Islam. In any case, everything points to a political and global economic reorganisation. Therefore, in the Master of Science in Business in Emerging and Frontier Markets we have included those countries that are usually considered as emerging, but which also offer extensive business opportunities. For example, Venezuela is often seen as emerging or frontier market, but the political and economic situation makes it inadvisable to do business in Venezuela. According to the World Bank, the five biggest Emerging Markets are China, India, Indonesia, Brazil, and Russia. Other countries that are also considered as Emerging Markets include Mexico, Argentina, South Africa, Poland, Turkey, and South Korea. All reputable economists agree that the future is in Emerging Markets. These markets already are the largest source of economic growth in the modern World, and their function is projected to increase considerably in the next twenty years. 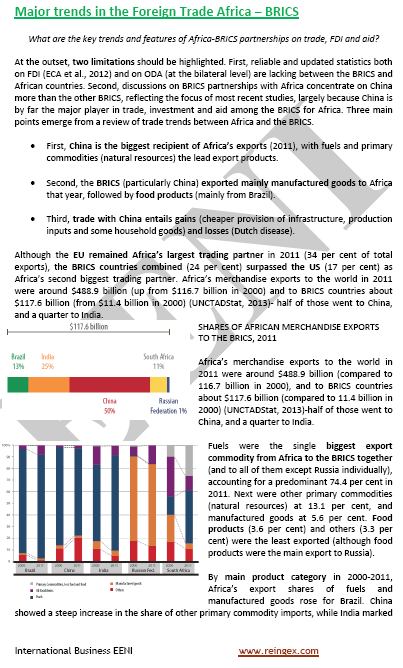 South Africa officially became a member of BRIC in 2010; BRIC was renamed to BRICS (S for South Africa). Like the concept of emerging country, the definition of frontier market is relative; there is no global consensus on which markets they are frontier or not. The term frontier market (or proto-emerging, pre-emergent) was created in the nineties by the International Finance Corporation, to refer (from financial a point of view) to those countries with strong and/or rapid economic growth that could turn into emerging economies. A frontier market is also a country more developed than less developed countries, but too small to be considered as an emerging market. From a financial standpoint, are often the riskiest countries for investment (country risk, political change), however, the markets with more expectations. Some countries considered a frontier had previously been emerging. Currently, the MSCI Frontier Markets Index is usually the most used. BRICET= BRIC + Eastern Europe and Turkey. BRICK= BRIC + South Korea. MIST: Mexico, Indonesia, South Korea, and Turkey. Big Emerging Market (BEM): Brazil, China, Egypt, India, Indonesia, Mexico, the Philippines, Poland, Russia, South Africa, South Korea, and Turkey. Secondary Emerging Markets: Chile, China, Colombia, Egypt, India, Indonesia, Morocco, Pakistan, Peru, the Philippines, Russia, Thailand, and the United Arab Emirate. Middle East Emerging Markets: Saudi Arabia, and the United Arab Emirates (UAE). European Emerging Markets: Croatia, Serbia, and Turkey. African Emerging Markets: Egypt, Nigeria, and South Africa.